I am looking for a papyrus painting, I used to have it in [/u]The Ancient Egyptian Book of the Dead, by William O'Faulkner. There seems to have been two versions made of the black cover edition that is the most contemporary version of The Book of the Dead. The newest one is missing the picture of the papyrus, in it is the individual male sitting on his toes with a black hat, a tree growing behind him, and Thoth and Seshat writing on the branches. I believe the picture is to the Spell number 151, "For donning the Head of Mystery." I can be mistaken though. Can you guys help me find the picture of the painting? Thanks. This painting on papyrus is missing from the 2011 edition of the book, it is in the 2005 published edition of the book. I don't understand, is that a riddle? I am looking for the painting in a book, I am not sure what year it was published. Now I find there are more than 2 years it was published in. I found a 2005 and a 2010 and a 2011 edition, and I purchased it in 2008, so I think there are at least 4 editions. These books were published through Barnes&Noble. Yes, I do. I am not sure it is this rendition though. I haven't seen it in a long time though. I found it in The Book of Dead by William O'Faulkner. I am pretty sure there is more than one rendition now that I look at this one. Where did you find this one? You wrote : "This painting on papyrus is missing from the 2011 edition of the book, it is in the 2005 published edition of the book." Actually, I don't know what edition it is in. There are at least 4 publishings, but they only differ in size of the book format, there seems to be 2 versions. It doesn't appear in the 2010 or the 2005 publishing, they are same edition just published in different size format as well as hardcover versus softcover. I am looking for the picture robson posted, I don't know what edition it is in. It looks like the one he posted, though I don't know where he got it. The illustration shows Amenhotep III with chepresh-crown who kneels on the hieroglyph for feast before the holy isched tree. 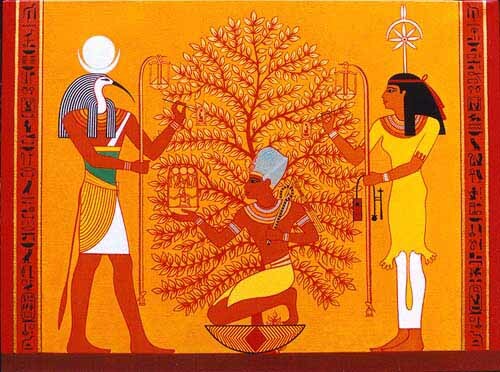 The gods Seshat and Thot write his throne-name on leaves of the tree. At the same time, they wish / give him an infinite number of sedfests, symbolized through the year-panicle with squid and hebsed-hieroglyph in their other hand. The presentation certainly does not come from a "Book of the Dead" papyrus. It is usually associated with the coronation of a king or his hebsed feast. They are most often found on temple walls, but also on jewels, furniture, and other royal objects of use. Thanks for the information. It is found in the Book of the Dead, but as a picture, I am not sure if it is a papyrus. I still haven't found the edition it was in. Again: I'm sure that there is no such representation in any of the known spell collections from Ancient Egypt that we call today "Book of the Dead". I can't seem to find the picture in the subcategories, do you know where you got it? Alright I found it on crystal links. I am wondering still though, if there is a rendition with reference to Amenhotep III, the crystal links website doesn't refer to the pharaoh, just the Seshat and Thoth.